Chuc Mung Nam Moi – This means “Happy New Year!” in Vietnamese. As you see in the photo, these trees are being carted all over the place. By motorbike, bicycle, even carried by hand. It’s the lucky tree for the Lunar New Year. I’m working from home today as we are now in the 3rd day of TET, the big celebration of the Lunar New Year. I returned home from Laos on Saturday night after a wonderful and peaceful week. The entire time in Laos (as you’ll read in the post below) I didn’t hear a single horn honking. It was heaven! On Sunday, I ran around town, stocking up on some groceries and cleaning supplies. The markets were all closed by about noon. In fact, at 10:30, when I was at the larger of the markets, the entire refrigerated section was being packed up; the frozen goods were already put away. I had a hard time getting around the market, as the employees were all mopping or sweeping the aisles. Such a different concept, you know? If we were to close a market for a week in the States, we’d wait until closing time to put away all the perishables and clean the floor. 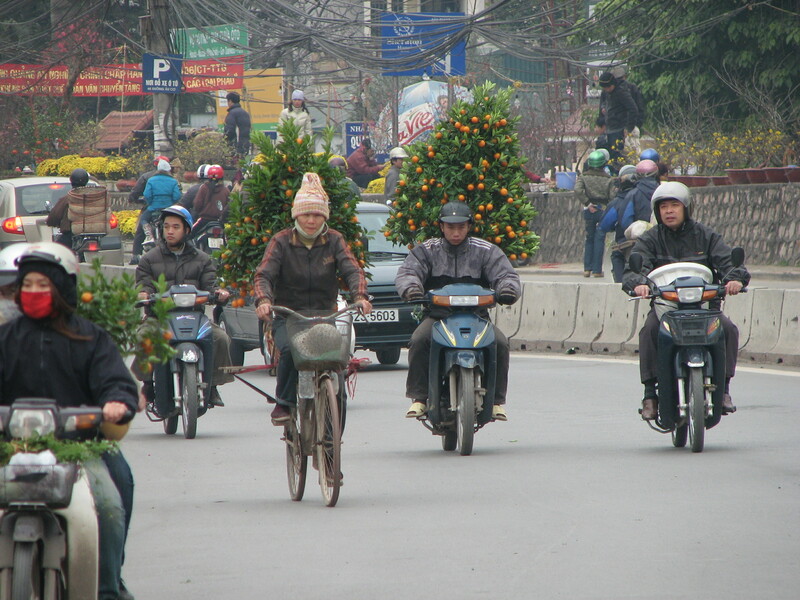 But Tet is a big holiday for the Vietnamese. Many go into holiday mode a week before and stay in this relaxed mode until a good week afterward. “It’s Tet” has become the only excuse for things not getting done. I was supposed to have my guest bed delivered on January 17th, but my apartment manager used Tet as the excuse for the reason the bed wasn’t finished and couldn’t be delivered. A week before! 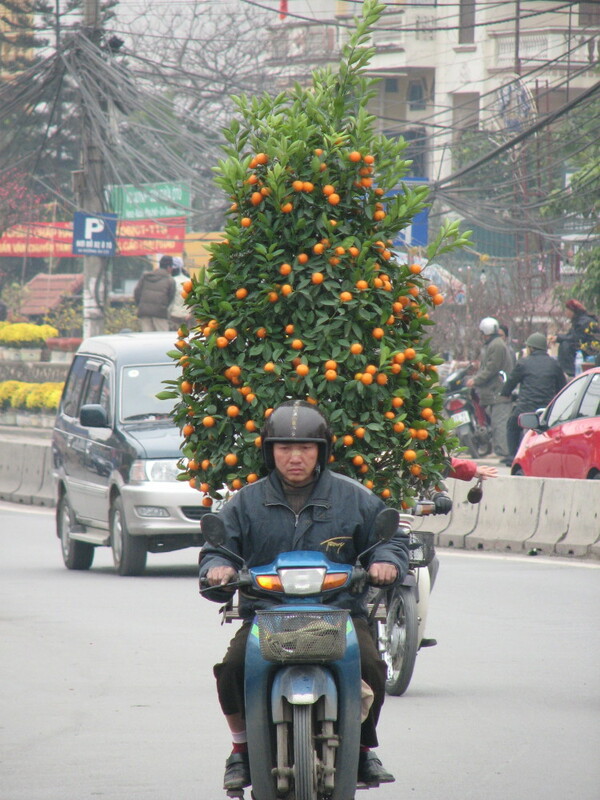 The photos I’ve included show many people on motorbikes or bicycles with large orange trees. They actually calls the cumquat trees. They consider them lucky, because like the Chinese, red is the lucky color and having these trees with brightly colored fruit on display in your home is lucky! You can also see in the photos that there are lots of other plants for sale during this time, again, all for their bright colors. While I understand the significance of the trees and the plants, I just can’t get over how crazy everyone looks carting these big trees around on motorbikes! It cracks me up! I literally stood by the side of the highway there and snapped away! Later in evening, actually at midnight on the 24th, fireworks and firecrackers went off all over town. From the comfort of my apartment, I watched a few different shows. What I liked more than the fireworks (because who are we kidding, nothing will ever beat the two-hour Fukuroi fireworks in summer in Japan) was the Chinese style lanterns which are lit with a candle and which float peacefully into the night sky. It is so beautiful. While I may have been a day late, I started Tet with a cleaning streak, just like the Vietnamese. They clean their homes thoroughly and prepare all sorts of foods for the festivities. I swept and mopped and cleaned my entire apartment and squeaked in a couple loads of laundry (It takes 45 minutes to wash – cold water only – and 2 hours+ to dry. I kid you not. It’s an all-day affair). I also added some photos of the lane toward my house, so you can get a better feel of the neighborhood here. Finally, I am spending most of this week working from home. I love being able to bundle up in my PJs with my new Laotian slippers and a cup of coffee. I really do think there is something very productive about working in PJs! Fire or no fire this year, I’m making marketing plans and will light a little fire of my own under our occupancy rates! Look out!